Word of Mouth While attending a local Republican Women’s club luncheon of which I was invited to speak, club member Sharon Sega informed me of her husband’s excellent military service to our country and I could not resist reaching out to him. John and I met at Valencia’s Corner Bakery where we had a great time swapping old stories, albeit mine were far older. Let me introduce you to USMC Colonel (retired), John J. Sega. Destiny Determined John J. Sega was born in 1965 in Burbank, California, but grew up in Northridge and he attended Notre Dame High School where he lettered in soccer and football. During high school, John held a job at Handyman Hardware store before graduating in June 1983. Following his graduation, John attended California State University, Northridge (CSUN) and earned his Bachelor’s Degree in Communications in 1987. During college John was inspired to pursue a military career and joined UCLA’s ROTC program and earned a scholarship there. However, he felt less than challenged and while at CSUN he met a Marine Corps recruiter and his destiny was promptly determined. 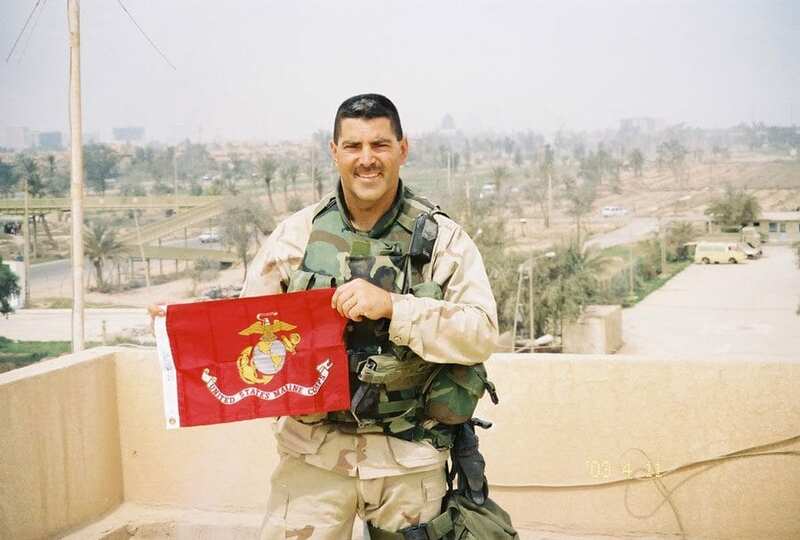 In August 1990, 1st Lieutenant John J. Sega, as an Engineering Platoon Commander, deployed with the 1st Marine Division as it formed the nucleus of a massive force sent to the Kingdom of Saudi Arabia in response to Iraq’s invasion of Kuwait. John’s crucial responsibility was breaching mine fields for advancing Marines. It was during Operation Desert Shield that the division supported Saudi Arabia’s defense from Saddam Hussein’s forces. In January 1991, the 1st Marine Division initiated offensive operations with Coalition Forces in Operation Desert Storm, also known as the “100 Days War”. The 1st Marine Division destroyed approximately 60 Iraqi tanks near the Burgan oil field without suffering any losses and the Division’s Task Force Ripper using Patton tanks destroyed about 100 Iraqi tanks and armored personnel carriers, including 50 excellent Soviet T-72 tanks. These efforts were crucial to Kuwait’s liberation from Iraqi forces. Active Reserves After John’s Desert Storm deployment, he left active duty and transitioned to the reserves and was assigned to the 3rd Air Naval Gun Fire Liaison Company (ANGLICO) at Long Beach Naval Station. During the next four years, John’s unit supported the U.S. Army’s 82nd Airborne’s operations. At this time, John attended Infantry Officer Course, Jump School, Pathfinder School, and the Royal Marine Exchange Program. In 1996, John was assigned to 2nd Battalion, 23rd Marines (2/23) serving first at Weapons Company (Port Hueneme) and Headquarters and Service Company (Encino). John has led a blessed private life beginning when he met his lovely wife Sharon in college back in 1983. First, they were simply friends but in 1986 there was romance in the air and they began dating which led to his marriage proposal and subsequent wedding on June 7, 1992, in West Lake Village. John said, “I was immediately attracted to Sharon’s graceful beauty, her sense of humor and desire for adventure.” John and Sharon have two wonderful and enterprising children, Steven and Laura. Steven is dubbed “Earthquake Baby” as he was born premature shortly after the massive 1994 Northridge Earthquake. He is currently pursuing post graduate studies in Microbiology at Denver, Colorado’s Metropolitan College. Laura completes her Bachelor’s Degree in Accounting/Finance at California State Polytechnic University at San Luis Obispo this year. Sharon’s admirable activities include volunteering for “Guide Dogs of America” training puppies to become guide dogs for blind and visually impaired people; she’s raised five at their home. John’s hobby is scuba diving and he enjoys the camaraderie of sharing whisky with his lifelong friends. Thank you Colonel John J. Sega and Sharon, for your long term service to our country and our community.